Here is a view of the desk area in her room. Please ignore the ugly desk, it looks MUCH better with the fresh coat of paint it got this weekend AND I found some darling knobs for it. 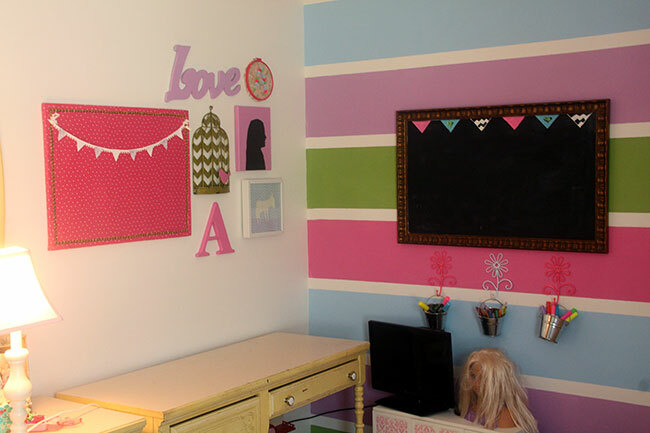 You’ll see the fabric pin board I made (see post HERE) on the left side and the rainbow striped wall (see post HERE) on the right of the gallery pieces. 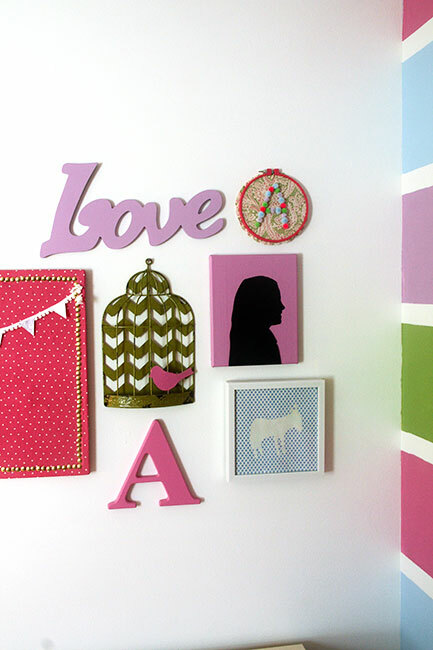 I decided to use colors from the rainbow wall (which matches her bedding) in the pieces that I used for the gallery wall. 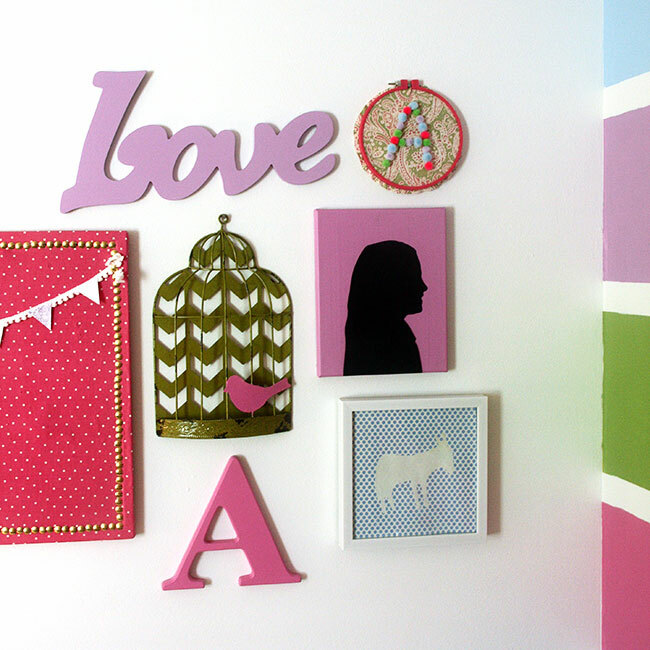 Letter A – Leftover from her nursery wall when I had her entire name hung up on the wall. It was from Babies R Us. 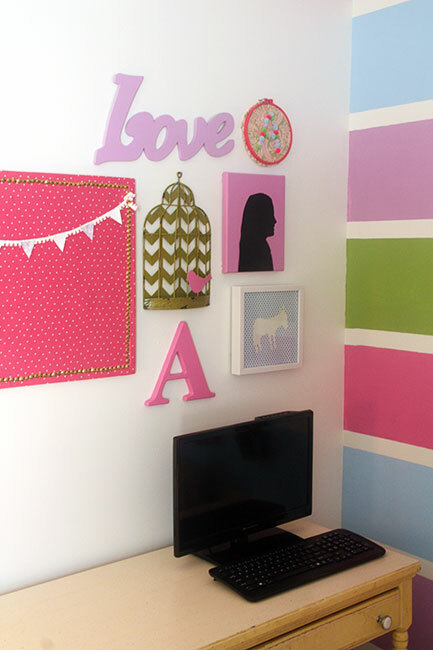 I painted in with the leftover pink paint I had from her striped walls. 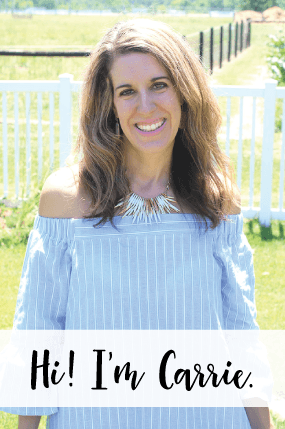 Bird Cage – New from Hobby Lobby. 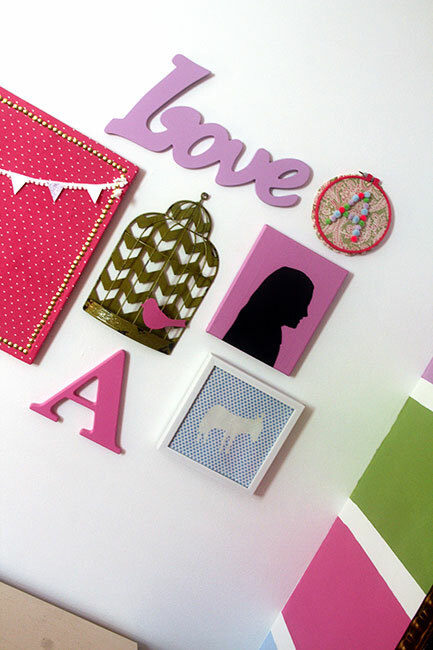 The bird was red and I painted it pink to match her striped walls. 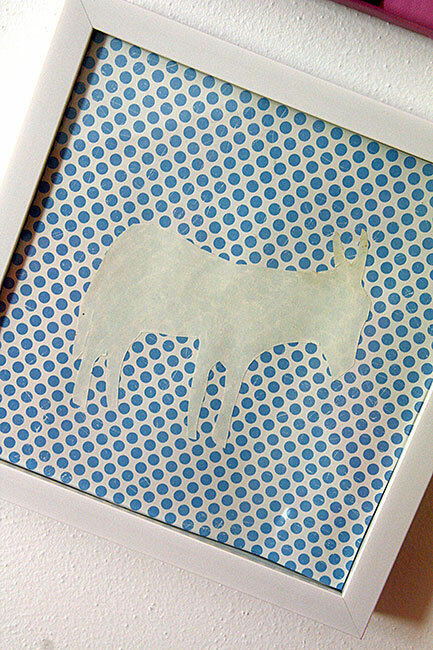 Horse Framed with Blue Polka Dotted Scrap Book Paper in White Frame – Frame and Scrap Book paper new from Hobby Lobby. Cut out horse was from my Grandma. 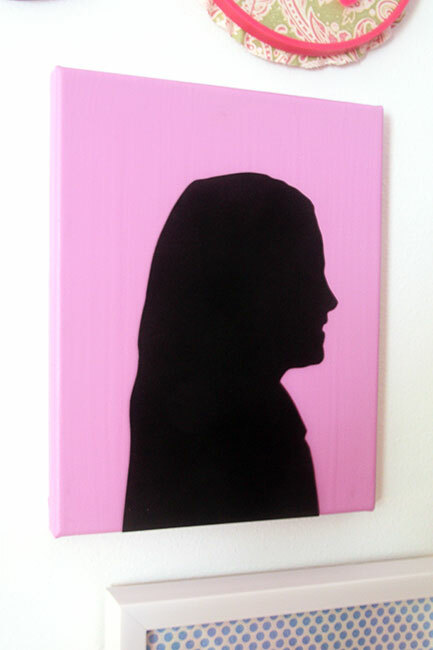 Canvas with Silhouette of my Daughter – Bought canvas at Hobby Lobby. 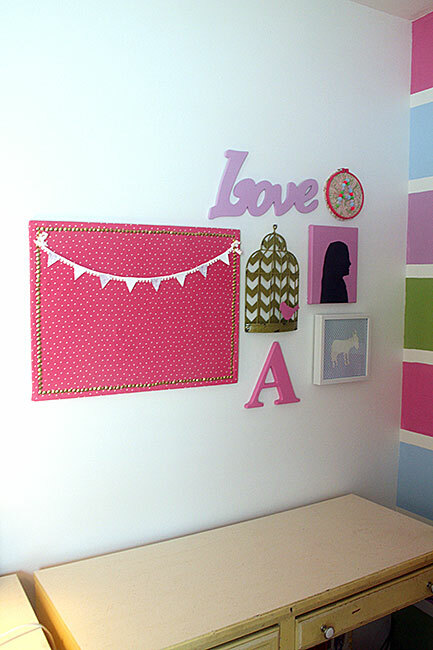 I had my daughter paint it with the purple and pink paint leftover from her striped walls. The silhouette cut out was from a Kindergarten Mother’s Day present she brought home for me. 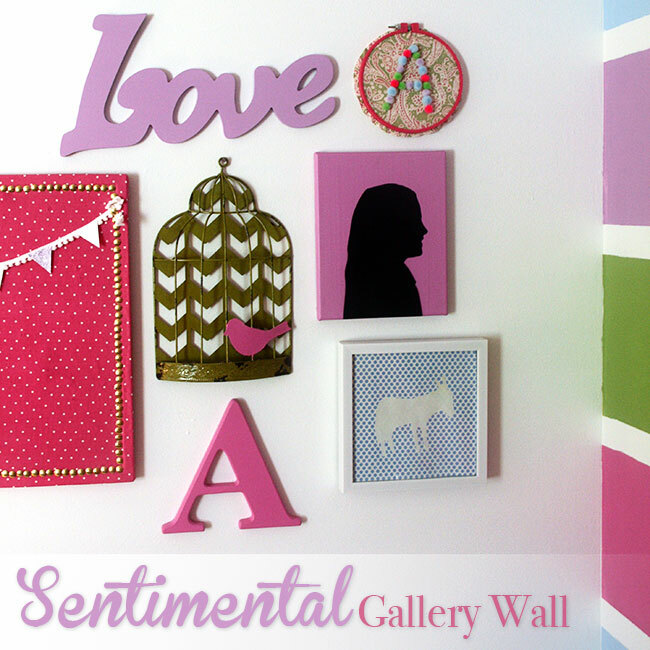 This piece is one of the reasons why I named this the sentimental gallery wall. My Grandma on my Mom’s side could cut out horse shapes from a piece of paper. We had a lot of these horses laying around the house when I was a kid, because she would cut one out for us every time we were at their farm. When my Grandma was in her seventies, she came to live with us at our house due to her declining health. Most of my memories of her are from when she lived with us. She loved to watch Mister Ed on TV and I would watch it with her. I also remember her giving me money for a picnic at school. I remember having her cut horses out of paper for me and when I came across this cut out horse when I was cleaning my office a few months ago, I knew it had to have a special place. I am the only one in our family with one of these cut out horses (the rest are gone) and when I started on Autumn’s gallery wall in her room I knew I had to frame this horse and put it on the wall. I hope that this will be a keepsake that Autumn will always keep, a sentimental piece of history from her Great Grandma that she never met. Another sentimental piece if this silhouette of Autumn from Kindergarten last year. Her brother made one as well and they were given to me as Mother’s Day gifts. I decided to take the silhouette shape and place it on a canvas that I let Autumn paint. 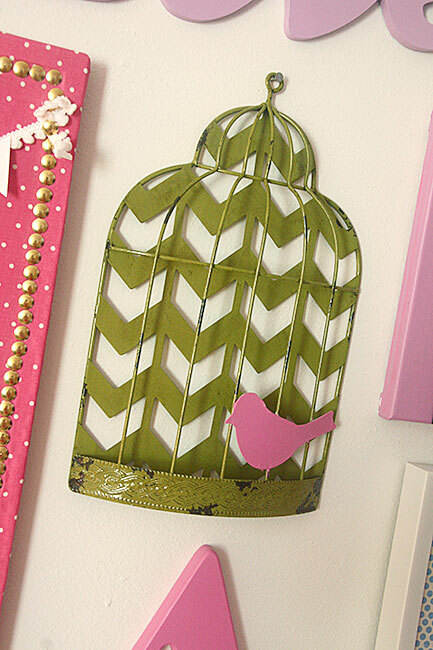 This bird cage piece isn’t sentimental, but when I saw it at Hobby Lobby I fell in love with it. Well, that is it! I can’t wait to share the furniture revamp with y’all next, it is AMAZING what a fresh coat of paint can do to some old furniture!